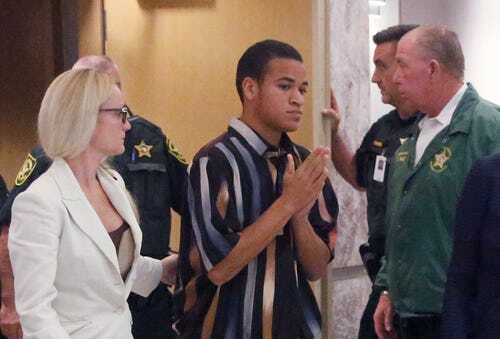 A California man has been arrested in connection with sending threatening messages to the families and friends of the victims of a shooting at Marjory Stoneman Douglas High School in Parkland, Florida. The arrest comes just weeks ahead of the one-year anniversary of the Feb. 14, 2018, rampage, which sparked a renewed debate over gun violence and turned students into activists. Siblings, parents and friends of several of the victims were tagged in posts on Instagram from Dec. 22 to Jan. 11, including posts on Christmas Eve and Christmas Day. The posts were initially shared under the username @nikolas.killed.your.sister, referencing Nikolas Cruz, the man charged with killing 17 students. Jesse Guttenberg, whose sister, Jamie, died in the shooting, also received direct messages on Instagram, The Washington Post reported. The family members and friends of the victims mentioned in the criminal complaint, filed in the Southern District of Florida, are only referenced by their initials. Fleury also used Instagram usernames like bullseyetauntsyou_, nik.taunts_, teddykillspeople and nikolasthemurderer, the complaint said. In one post, he said “I killed Janice Ott and Denise Naslund,” two of serial killer Ted Bundy’s victims, according to the complaint. Authorities searched Fleury’s home in Santa Ana, California, after subpoenaing Instagram for the account information and IP addresses linked to the posts and messages. All of the accounts were used on the same IP address, registered to Fleury’s home where he lives with his father and brother. The FBI and Instagram did not respond immediately to a request for comment. “Fleury did not show remorse for posting the comments,” the complaint said. He will appear in front of a federal magistrate on Monday. Fred Guttenberg, Jamie Guttenberg’s father and a high-profile gun control advocate since the Parkland shooting, was tagged in some posts, The Washington Post reported. Guttenberg tweeted Monday about his daughter’s tombstone unveiling, which occurs approximately a year after a person’s death in the Jewish tradition. Yesterday we had the unveiling of Jaime’s tombstone. In the Jewish religion, it is a ceremony that happens approx one year after burial. For us, it was reliving this pain all over again. I should have spend these past few months planning her Sweet 16 and instead, I did this.